(NaturalNews) It's already tough to get a decent job in the Obama economy, but increasingly, technology is making it even tougher. That's because more and more functions of society are becoming automated - that is, machines are taking over duties that humans once performed. What happens to the data, though? Security officials are using more machines that employ biometrics - which can verify a person's identity through various physical traits (eyes, fingerprints, etc.) - and that has raised questions and concerns about the advantages and strengths of humans versus machines in being able to detect would-be terrorists. Industry officials told the paper, however, that the advantages of biometrics and computers outweigh any inherent risks, and as such they are promoting more automation as a way to make air travel more efficient and less frustrating (and more cost-effective). Eventually, experts say, technology could "get rid of the boarding pass completely," with air travelers' faces serving as their ticket and pass, Michael Ibbitson, chief information officer of London Gatwick Airport, told WSJ. He said he performed a trial last year in which 3,000 travelers on board British Airways flights were processed without boarding passes. The travelers had their irises scanned when they checked in, which enabled cameras at security checkpoints and boarding gates to recognize them automatically. "We're only just beginning to see what biometrics can do," said Gatwick. Proponents including government and industry officials - and, most likely, scores of Americans who are fed up with being felt up, groped and humiliated by aggressive Transportation Security Administration screeners - say automating airport security procedures will free human screeners up to focus more specifically on suspicious behavior among travelers. Also, for some aspects of security, they note that computers can be much more thorough and efficient, as well as less error-prone, than humans. But critics rightfully worry about - as usual - stored data being hacked or stolen, and that too much automation will dull human screeners' senses and intuition, thereby causing them to miss detecting something when it is just doesn't feel right. "If you're sweating profusely, for example, the person checking your ID would notice. But that computer taking an iris scan wouldn't," said aviation-security expert Arnold Barnett, a professor at the Massachusetts Institute of Technology. He adds that a key part of airport security is "looking at all kinds of things that can't be captured by an algorithm." 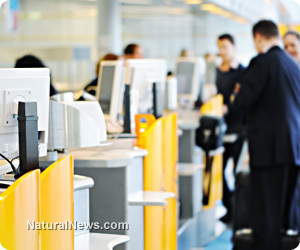 Currently about 28 percent of the world's airports use some form of biometric technology. That's up from 18 percent in 2008, a survey by SITA, an airline information technology provider, says. The International Air Transport Association and Airports Council International, two of the industry's largest global trade groups, advocate automation as part of their initiative to streamline airport security. The groups say the lengthy and cumbersome security process is deterring some travelers from flying, and note that the average checkpoint now processes about 150 passengers an hour, half the rate before the terror attacks of Sept. 11, 2001. The groups' "Smart Security" initiative will use checkpoints at Amsterdam Airport Schiphol and London's Heathrow Airport beginning sometime this year to test key aspects of screening technology, which will probably include new baggage-screening software that can automatically clear some objects like clothing, so they won't have to run X-ray images past human screeners.